The Aurum Cables Cat6 Snagless Ethernet Cable is a professional grade cable for your office, home office, server room, and any other network environment. 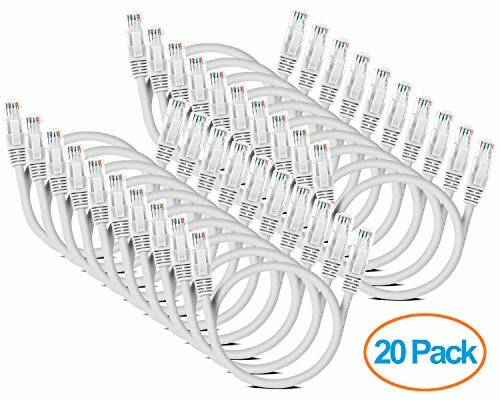 Category 6 LAN cables can be used for network components such as modems, routers, hubs, ethernet switch boxes, android boxes, network media players, computer servers, PCs, printers, NAS, VoIP phones, PoE devices, XBOX ONE, Playstation 4, and many more. Do you like keeping your wires neat and tidy in your network environment? We offer all different sizes and colors so you can customize to your liking. This includes color coding and getting that perfect length cable. Our Cat6 cables outperform the rest. Get yourself low signal losses and top notch transmission performance. Our cables support up to 550 MHz and are perfect for all types of ethernet standards, including fast ethernet, gigabit ethernet, and 10-Gigabit ethernet. We only make our cables with the best materials. All of our cables are made from 100% bare copper wire. This is fully compliant with UL Code 444. You'll see a lot of other branded cables using copper clad aluminum (CCA) wire, which does not give you the same quality of connectivity. We stand by our products. All cables come with a Limited Lifetime Warranty with product support.